Maybe the 4th of July set a dangerous antecedent and I didn’t even know it. 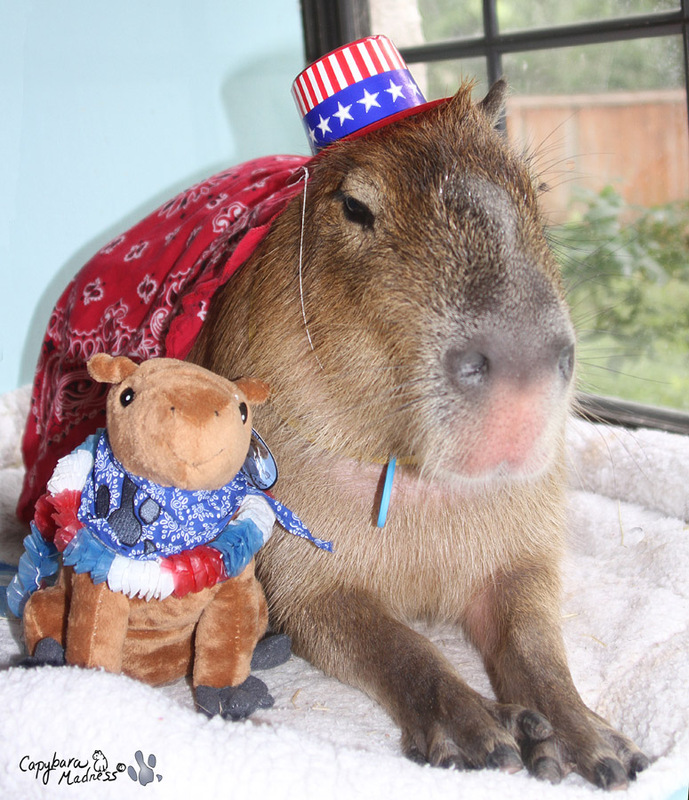 It all seemed so innocent, just my Super medallion (of which I am very proud), a dumb little hat and a bandanna over the back, plus whatever Capycoppy had to wear. A whole month passed between that and the bandanna. I thought she had forgotten. Today, I found out she had not. It all started with her taking photos of my food. 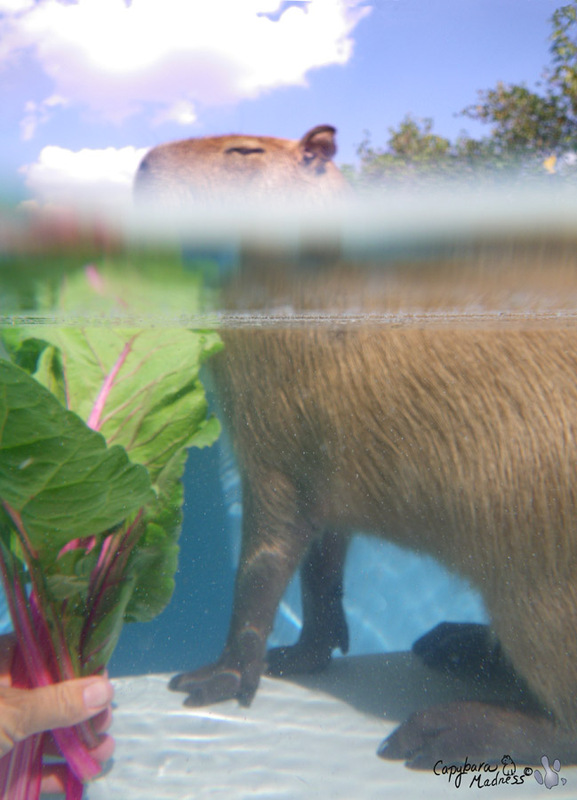 I love a bunch of Swiss chard to munch on in the pool and usually Melly loves to feed it to me, often while snapping photos of my dainty eating habits. Today, she decided that the chard was pretty enough to photograph on its own! What is up with that? It is food, not art. Okay, art is in the eye of the beholder but if chard is any art it is culinary art and not photographic art. That’s all I’m saying. She seemed to be coming to her senses when she positioned the chard so that I filled most of the frame. I like the way the chard looks gigantic and it is right underneath my mouth, a tremendous improvement over the original. It does not take a rocket scientist (by the way, even though Melly’s dad was a real life rocket scientist, she certainly is not!) 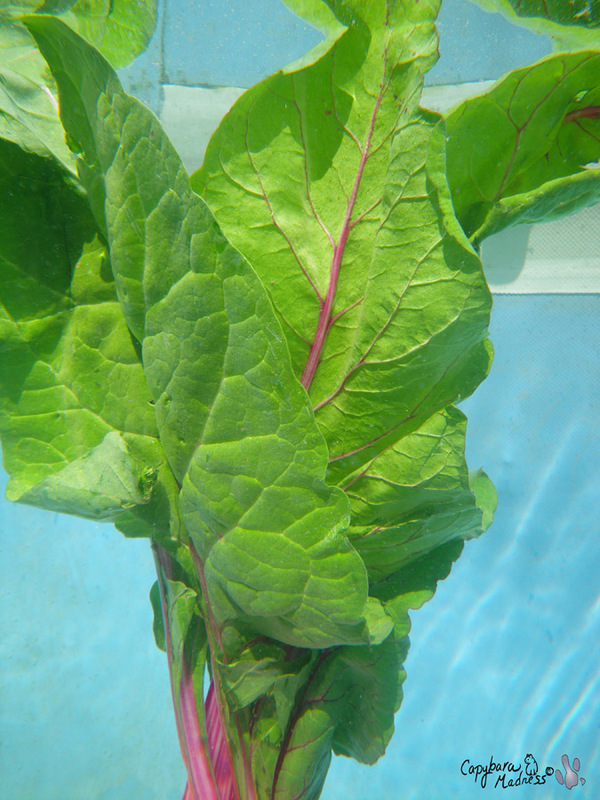 to know that chard should not be placed on the head. It is not a hat. It is not jewelry. It is not art. It is annoying. This is even more annoying. Not only can I not eat the chard, I can’t even see. Why would she do this to me? Normally, I like to humor Melly. She’s mostly harmless and she does do some nice things for me. But this was crossing the line. I had the upper paw here though, the water is my natural element. 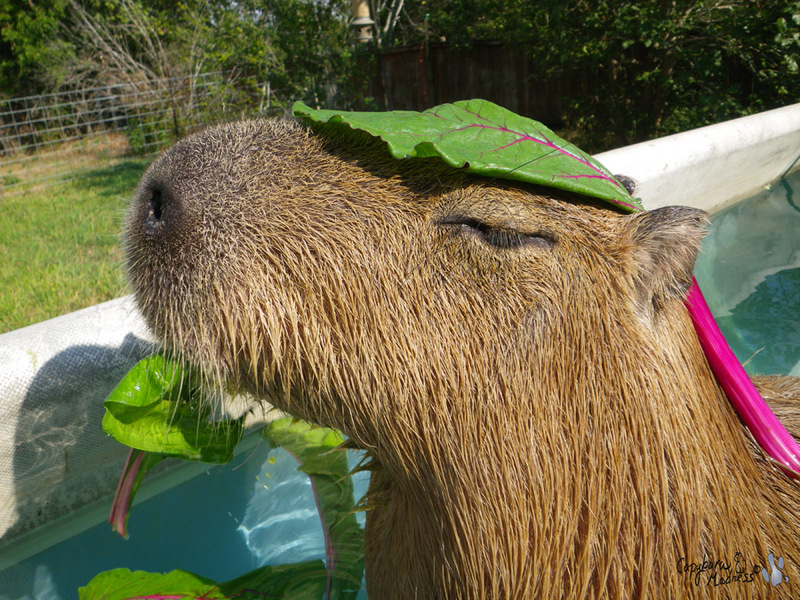 Things do not stay on capybara heads when we are underwater. That chard came right off, I didn’t even have to roll although I did anyway. 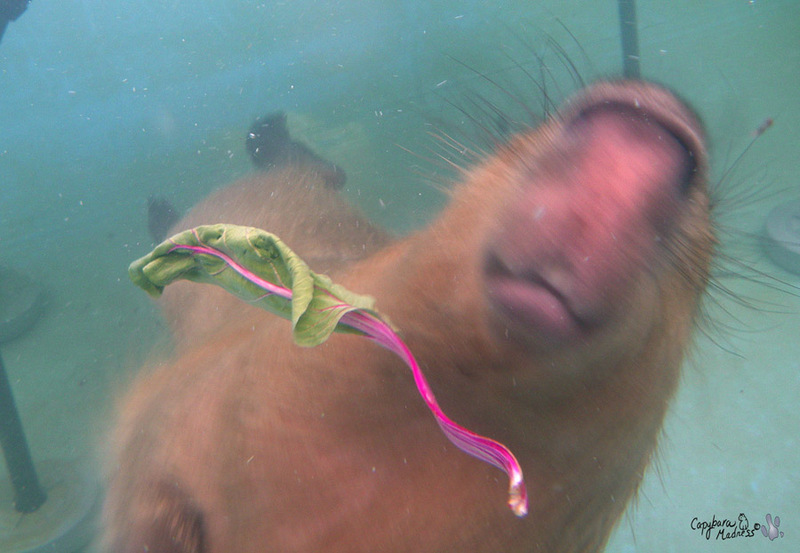 When that chard floated right in front of me I snapped it up and ate it. So much for art. 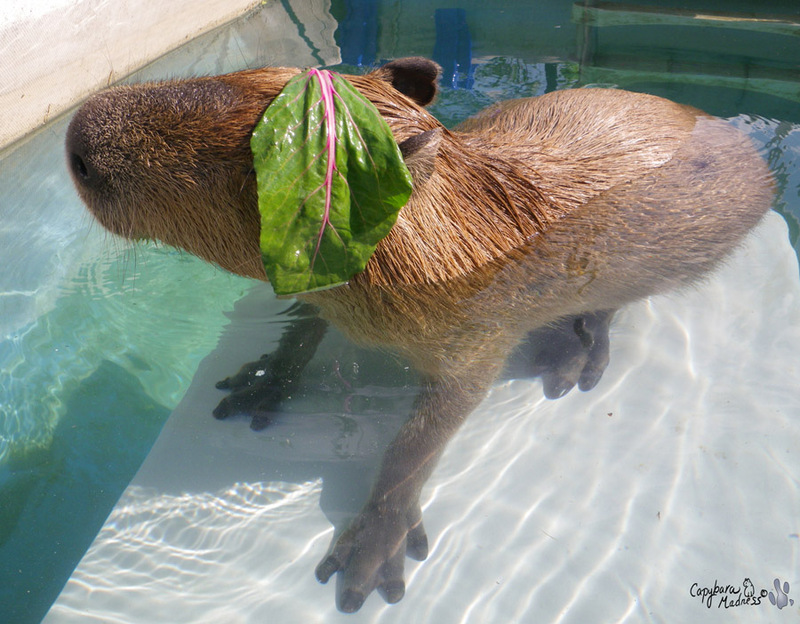 As is clearly demonstrated by the above photo, a capybara does not need any props in order to be art. We are 100% natural, beautiful art. But I could probably be talked into wearing that bandanna again. 13 comments to What to wear? My daddy says if I don’t eat it, I have to wear it. I have had much lettuce of shame on my head. No matter. I get around to eating it anyway. That last photo of you is absolutely sweet, Gari! You really do have quite an adorable nose! Hi Gari! You like like you have completely recovered from your recent surgery and are doing well. The bandana really does look sporting on you! This is not a good trend, my friend. Gari, you are cuter than my dog in a bandana!! Jen S., Yes! If you look at the photo you can see that my nostrils are closed. Compare it to a photo of me above water and it becomes more obvious. You are so adorable Gari!! Mommy’s always make their kids do and wear silly things for pictures! Oh Gari! The human noise I made over that last picture woke up everyone in my house! You are the most handsome rodent ever! 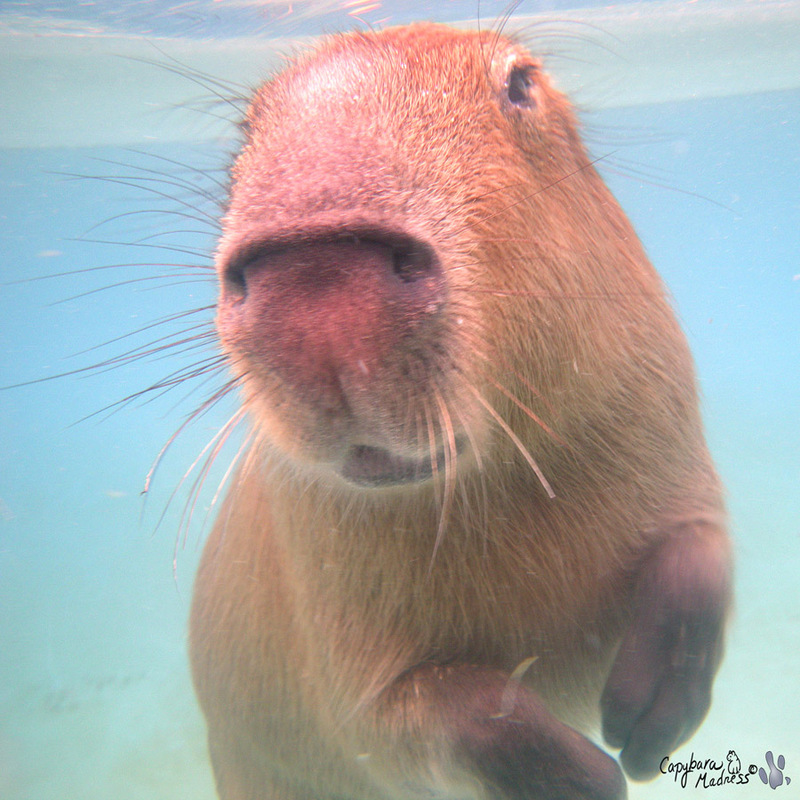 Well most handsome Giant rodent anyhow! Oh, Gari, how I understand you! 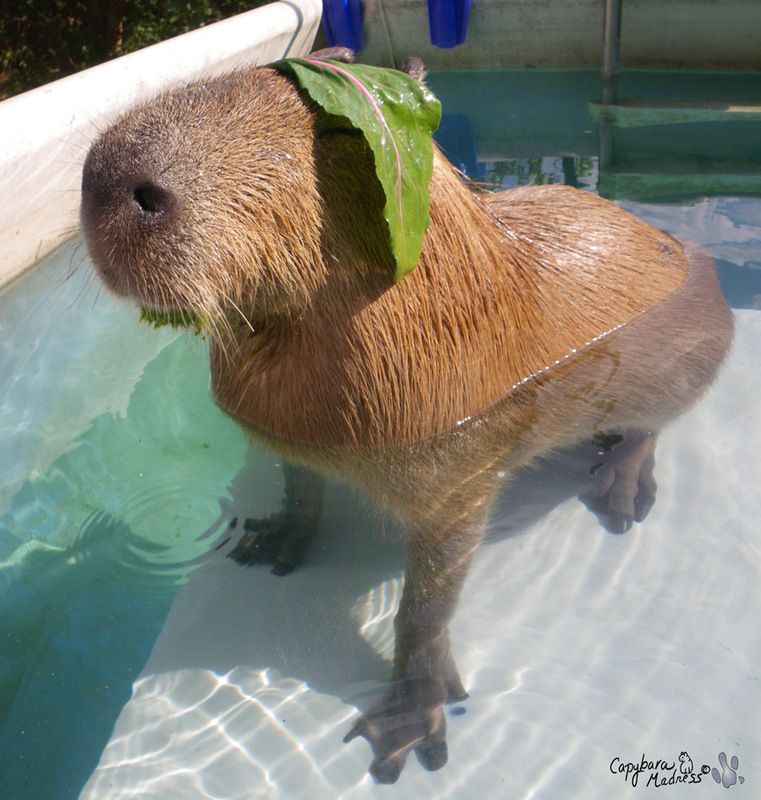 My owner also likes to annoy me by putting the lettuce or endive leaves on my little head! And then she laughs! Duh! I totally agree with you, food is not art! WE, rodents, are art! Well, especially rodents from “caviidae” family, don’t you think? We are the most artistic ones! And I really envy you, you’re soooo photogenic! You always look well in the photos! That “Free at Last” picture makes me dizzy. And I agree the last photograph is ART! I love it!